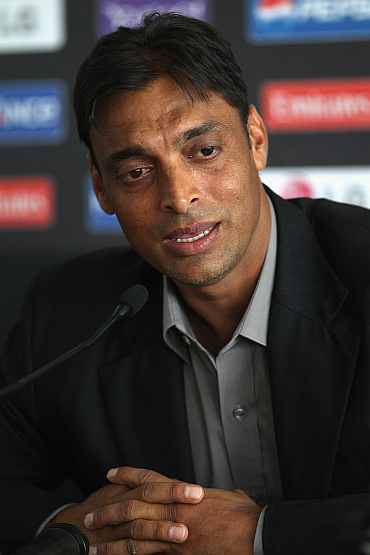 Former Pakistan fast bowler Shoaib Akhtar has denied any news of him getting married with a 17-year-old-girl. In a series of tweets Shoaib said: "Wishes are always welcome but not for some crap rumour...My journalist friends, I expect sensible reporting and not rumour spreading. Thanks! I have received many messages from my friends in the media across the world. Following is my statement on reports of my marriage. I would like to confirm that I'm not getting married to 17 year old girl; there is absolutely no truth in the story being reported. If not me, at least respect the girl! Totally False." Earlier, The Express Tribune newspaper had reported saying that the former Pakistan fast bowler Shoaib Akhtar is set to tie the knot with a teenage girl, Rubab from Haripur District. Businessman Mushtaq Khan's daughter Rubab has little interest in cricket and has three older brothers and a younger sister. The newspaper had even quoted saying that Shoaib's wedding dates were finalised for the third week of June. Sri Lankan wicketkeeper Prasanna Jayawardene said that he expects England to come 'hard' during this month's two-Test series after suffering the ODI series loss at home. Sri Lanka bagged the five-match ODI series 3-2 with a six-wicket win at Edgbaston in the final on Tuesday, and Jayawardene, a Test specialist wicketkeeper, said that after the ODI series loss, England would be coming hard, adding that the squad knows about that and are ready for that. Jayawardene spoke after the third day of Sri Lanka's four-day tour match against Northamptonshire at Northampton got washed out without a ball being bowled. Sri Lanka will face England in two Tests during this tour, with the first one being held at Lord's next week and the second one at Yorkshire's Headingley headquarters in Leeds, the report added. Jayawardene said that the Sri Lanka squad wants to win a series in England, as they have never won a series involving more than one match against the English side. Former Pakistan captain Younus Khan has reportedly declined signing the new central contract that sees him demoted to the 'B' category. An official close to Khan said that the veteran cricketer is really angry and disappointed about being demoted to 'B' category and has decided not to sign it. According to The Express Tribune, the official added that for Khan the most important thing is his self-respect and that he is willing to play for Pakistan without getting remuneration from the central contracts. Meanwhile, a Pakistan Cricket Board (PCB) official said that the chairman Najam Sethi had warned the committee that their decision would backfire, adding that despite the warning Moin Khan, Mohammad Akram and Zakir all stressed that it was the right move according to the new categorization formula.